My 16 month old son loves to take baths. Up until recently he has been quite content with just splashing water all over and playing with his rubber duckies. It has come time to experiment with objects which can be added to his bath that are both fun and safe for him. All of these objects we already have in our home so no need to go out and make any special purchases. 1. Food coloring. Add a few drops to the bath water. 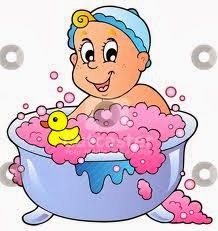 along with the fun of seeing their bath water change colors it is a great way to help them learn their colors. 2. Plastic cups/containers. They love filling and dumping water. 3. Strainer. By submersing the strainer under water and then lifting it up a rain shower is created. 4. Balloons. These are always a fun addition anywhere. 5. Spray bottle filled with water mixed with food coloring. As they spray the water the water will become colored and no longer clear. 6. Colored ice cubes. This one seems to be a favorite with my son. What kinds of items do/did you give your toddler to play with in the bathtub? Loved your creativity. The only one that made me cringe was the balloons. I am so fearful of balloons with toddlers given the risk of them putting them (or pieces) in their mouth. But that is me :) I was your neighbor at Fun Fridays. Have a great weekend! I cannot blame you for feeling fearful about balloon pieces. I too felt this way at first. However I thought if I am going to be watching him while he is bathing and playing then I should not have so much fear. I visited you back but could not find place to comment. Following via GFC. Shaving Cream! ALways a winner...but a waste! Thank you for stopping by! Awe I have not thought about shaving cream although we do not use that product in our home anyway. We also do sharing foam painting in the bath. A few drops of food colouring in a pot then mix with shaving foam, make up a few colours and give them a paint brush. My 1 and 3 year olds both love it. I like your idea of using the pot to mix up food coloring with shaving cream. Thank you for the follows back! Awe that is so sweet! Mine loves to scoop and dump water though if I turn my head for just a few seconds he is pouring bath wath water in his mouth. He now 17 months and still putting nearly everything in his mouth. I love the idea of adding food coloring to the water, how much fun. Hope you have a great day! Thank you for stopping by Deborah!